Casein (kay'seen) is a quick-drying, aqueous medium using a milk-based binding agent, and is one of the most durable mediums known to man. Nine thousand year old Casein cave paintings have been discovered in Asia, and later, the medium was used by Byzantine, Roman and Renaissance artists including the Old Masters. In 1933, Casein pigments in tubes were developed by Ramon Shiva who relied on the expertise of the artists who used them to help perfect his high-quality paints. Today, Jack Richeson & Co., Inc. manufactures Shiva's Casein colors and is dedicated to bringing back the original quality and formulation of the pigments. 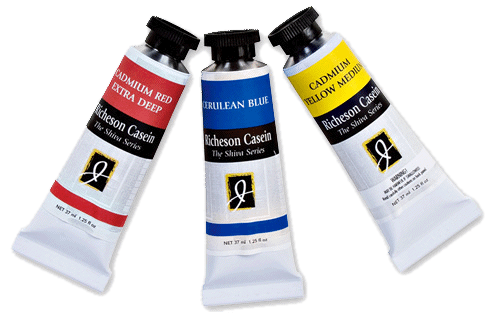 Known for their versatility and array of capabilities, Casein paints can be used to create a variety of effects from the rich opaques of oil to thin watercolor washes. Casein paints may be applied to almost any rigid, non-oily surface such as canvas panel, illustration board, heavy watercolor paper, plaster, metal, wood, masonite, or canvas, or linen mounted on masonite. And they can be reworked or layered repeatedly and be used for underpainting. Because Casein has an exceptional integrity of color and always dries to a perfect matte finish, it is unexcelled for art reproduction. The velvety matte finish can also be buffed to a satin sheen or varnished to produce a resemblance to oils. Over time, Casein pigments become resistant to moisture and as history has proven, the medium has a durability and permanence which has easily stood the test of time. Shiva Casein paintings are the most beautiful colors that I have been using for several years. These colors are smooth and of some way they feel sensual when you deep your brush in them. I have painted with oils and acrylics, but always return to my beloved Shiva Casein. And let me tell you that Jack Richeson & Co. Inc. manufacturers of Shiva's Casein Colors are the best! I recommend that every artist try this Shiva's Casein colors. You will never forget them! Thank Jack Richeson & Co. Inc. for continuing the tradition and better!